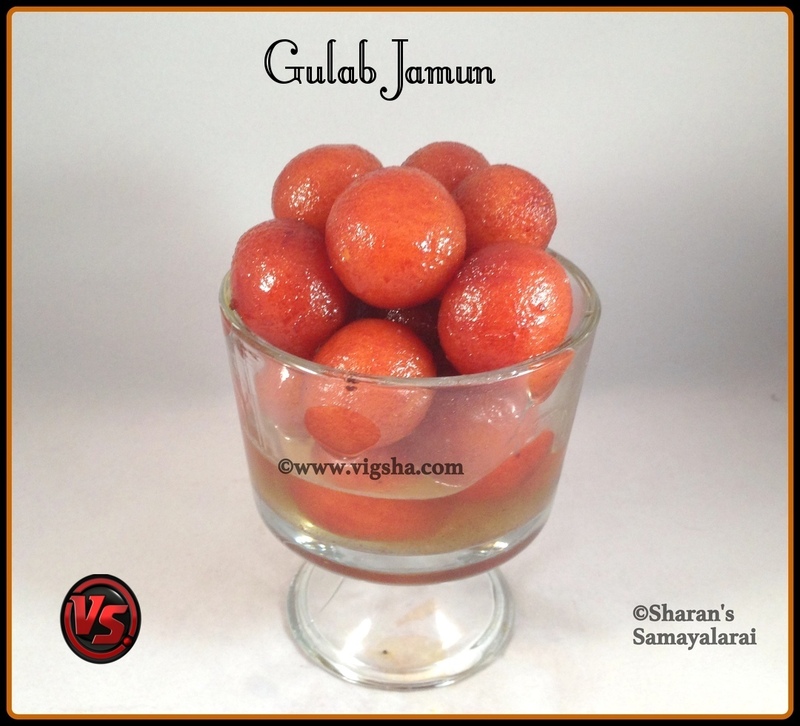 Gulab Jamun is India's most popular and tempting desserts! It is the only sweet which suits for all occasions. Spongy milk dumplings, that are deep-fried, soaked in flavored sugar syrup and served chill. 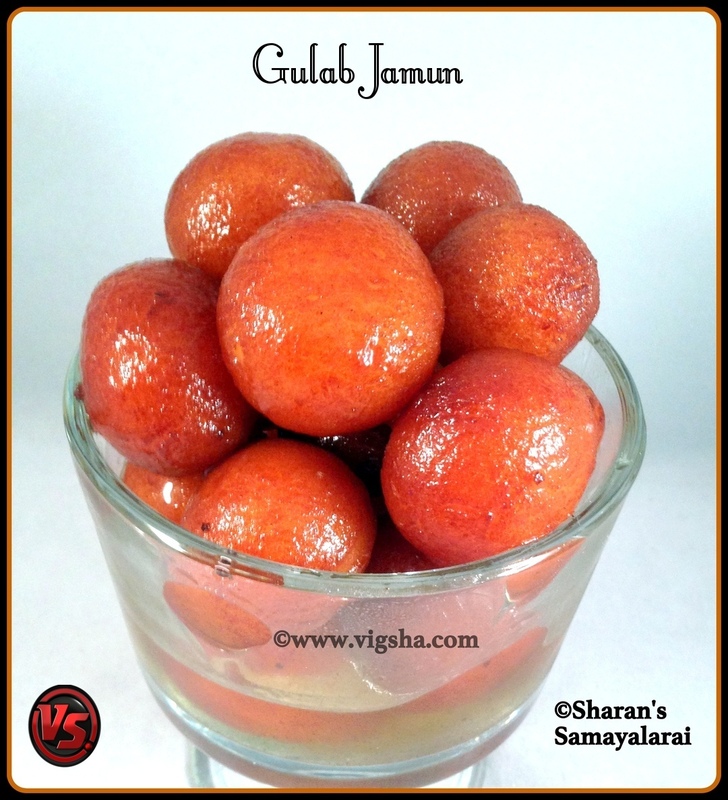 I have already posted the recipe for Khoya Jamun, you can check the recipe here Khoya Jamun. "Happy Krishna Jayanthi" wishes to all my readers !! 1). Preparing Sugar Syrup: Combine water and sugar in a pan and bring to boil. Then add cardamom powder and saffron into the sugar syrup. Let it boil for 10-12 minutes in medium flame, until the sugar dissolves completely and reach thick consistency. Switch off and set aside. 2). Sieve flour(maida), milk powder and cooking soda without any lumps. In a wide mixing bowl, mix this flour mixture with melted ghee. Sprinkle milk little by little and just gather them to form a smooth dough without any cracks. Do not knead the dough. Cover and set aside for about 10 minutes. Grease your palms and make equal-sized small balls. Just roll the balls softly and make balls. 3). Heat the oil in medium flame. When oil is hot, slowly drop few jamuns. Add few jamuns at a time and deep fry them in batches. Do not over crowd the pan. Keep rolling the jamuns gently using the laddle so that jamuns are evenly cooked. 4). Once it turns golden brown, remove them using a spatula and drain it on a paper towel. 5). Slowly drop the drained jamuns in the sugar syrup. Finally add the rose essence. Let the jamun to soak in the syrup for 5 to 6 hours. Garnish with silvered pistachios or almonds. Serve warm or chill with scoop of vanilla ice cream. # Make sure to add very little baking soda. If you add more, it makes the dough very soft and they break apart when frying. # The dough should be in correct consistency, neither hard nor loose. This helps in yielding soft Jamuns. # Do not knead the dough at any time. It will make the jamuns hard. # You can substitute milk with water for making dough. # Make small balls, as jamuns doubles the size after soaking in the syrup. # While frying the jamuns, keep turning them so that they get fried evenly. # Make sure the flame is in medium, through out the process. If you fry the jamuns on high flame, only the outer part will be cooked and inner part will be hard. # Use wide pan to soak the jamuns in the syrup. Jamuns grow in size after adding them in the syrup. Do not over crowd them. They should have enough space to expand. If crowded, they break. # Let the jamuns sit in the syrup for at-least 30 minutes.